The residence is the result of a careful refurbishment of a typical building of the old town: the charming inner patio reminds us of the architectural style of the Arab-Spanish years, which characterizes the whole city centre. San Domenico Residence, with its 17 apartments of different sizes, is set in the heart of the old town, between the beach and the port. All the apartments have independent air-conditioning for both heating and cooling, an equipped kitchenette, flat screen TV, bathrooms with bidet and shower, hairdryer, linen and amenities. 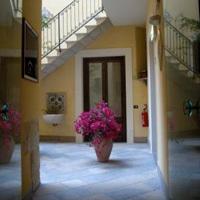 San Domenico Residence offers their guests free Wi-Fi in the whole building. From the sun terrace, one can enjoy a charming view of the old Trapani, where the Kasbah meets the Jewish ghetto called “Giudecca”.